Adobe Photoshop comes with a good complement of creative brushes, but occasionally, a custom brush you need isn't readily available. What if you want a spongy brush to help you create a textured background? Or what if you need a brush that looks like a wheat stalk, so you can create a field of wheat for a project? Below, I'll walk you through the steps of how to create your own brushes. The instructions were written with Adobe Photoshop CS4, but with minor modifications, they also can apply to other Photoshop versions, including the new CS5. In general, Photoshop brushes fall into two categories: paint-type and image hose-type. A paint-type brush is meant to mimic the texture and behavior of a real painting tool, such as a paintbrush, sponge brush, or paint roller. On the other hand, an image-hose type brush sprays a single graphic element onto your canvas, allowing you to vary its size, shape, and color. It is often used to create fields of grass, layered hair, or even falling snow. The process of creating a brush is actually quite straightforward; with a simple menu command, you can turn any image into a brush tip. There are few things you need to understand before you start. First, a brush tip is a grayscale image. Any part of the brush tip that is black is fully opaque, and will yield full color when used as a brush. A color image made into a brush tip will be converted to grayscale, and the gray values will be partially transparent; this transparency will carry over to brushstrokes. Second, you need to be conscious of brush size. If your brush tip is 500-by-500 pixels, you can scale it down to 25-by-25 pixels without any loss of quality; however, if your brush tip is only 25-by-25 originally, scaling it up to 500-by-500 pixels will look terrible. Spongy Brush—Using a loofa sponge, dab black paint onto a canvas. After it dries, scan or photograph the texture and bring it into Photoshop. Convert the image to grayscale (Image->Mode->Grayscale) and tweak the levels (Image->Adjustments->Levels) so that white areas are free of texture and black areas are pure black. 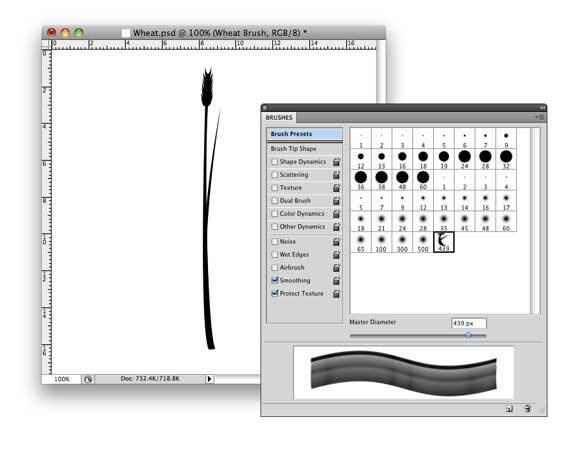 Wheat Stalk Brush—Use Adobe Illustrator (or another vector drawing app) to draw a single, detailed stalk of wheat. Do not use any color; the stalk itself should be black and the background transparent. Import the final artwork into Photoshop. Flower Brush—Open a photo of a flower in Photoshop. Convert the image to grayscale, as above, and then mask the flower, if needed. (For assistance on masking techniques, see my article, Masking 101). Now, tweak the levels to add more contrast to the flower. Make sure none of the flower areas are too light—if they are, they’ll be virtually transparent when used as a brush. You can create a brush from any image; here, we’ve made one out of a wheat stalk silhouette. Once you’ve made the necessary edits, you may need to scale the document down to a more reasonable size. Choose Image->Image Size, enter a maximum width or height of 500 pixels, and click OK. Now choose Select->All and then choose Edit->Define Brush Preset, and type a name for the brush. The brush head is then added to your current set of brushes. Save your brush and close the document window. Now choose File->New, enter a document width and height that matches the resolution of your display and click OK. This new document will serve as a scratch pad for the next step. You’ll need to fine-tune the new brush for best results. Select the Brush Tool and choose Window->Brushes. Once the window appears, click Brush Presets. You’ll see your newly defined brush at the bottom of the list of brush thumbnails; click it once to get started. An important warning: changes you make to this brush are not automatically saved. After you’ve made your tweaks, you must save the brush as a new preset. Click the tiny document icon in the bottom right of the Brushes window (next to the trash can) to add a new brush preset, then enter a new name for the brush, and click OK. The revised brush will now appear right beside your original brush; to delete the original, click it once to highlight it, hit the trash icon in the bottom right, and then click OK.
Why do this? Because you cannot save over an old brush preset. Any time you make changes to a brush, you need to save it as a new brush preset, or the changes will be lost. You do not have to delete the old brush, but doing so will avoid confusion about which brush is the newest. A strategic naming convention could also serve that purpose if you want to keep brush versions. At the left of the Brush window, you’ll see a long list of brush options. The options you enable will vary greatly with the type of brush you’re building; for example, if you’re working on a wheat stalk-shaped brush, you’ll be concerned with Shape Dynamics, Color Dynamics, and Scattering. At the bottom of the Brushes window, you’ll see a preview of your current brush. Every change you make to the brush will be reflected in the preview, but unfortunately, it’s limited to grayscale. To get a proper color preview of your brush preset, simply use the brush tool to paint onto the current document. Adjusting shape dynamics lets you vary the size, angle, and roundness of each brush mark. Brush Tip Shape—Typically used for paint-type brushes. You can edit the default size of the brush, as well as its angle, roundness, and hardness. You can also set the spacing for the brush bristles, which can be important when creating image hose-type brushes. Shape Dynamics—Typically used for image hose-type brushes. 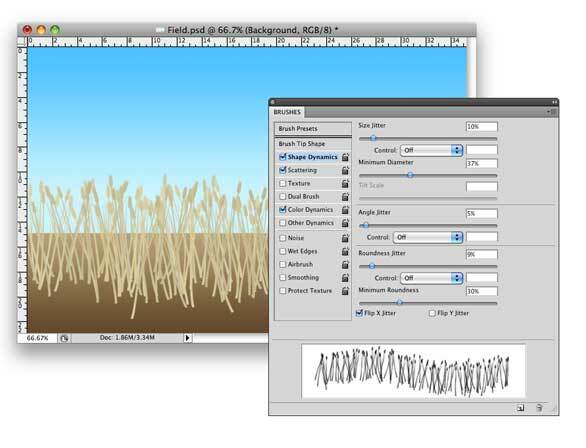 Size Jitter, Angle Jitter, and Roundness Jitter controls vary the shape of each brush mark (single dab), letting you create fields of wheat in which each stalk has a unique shape. Additional options let you tie the brush variations to graphic tablet input, such as pen pressure and pen tilt. Scattering—Typically used for image hose-type brushes. Scattering varies the placement of each brush mark, allowing for a more natural distribution of paint dabs such as grass, leaves, or snow. Texture—Typically used for paint-type brushes. This option lets you apply a pattern to each brush stroke to give the impression of texture (such as canvas). Dual Brush—Applicable to all brushes. This option combines two tips to create brush strokes; it places the texture of the secondary brush stoke within the boundaries of the primary brush stroke. Color Dynamics—Typically used for image-hose type brushes. Hue, Saturation, Brightness, and Purity sliders let you vary the color and intensity of your brush stroke, adding even more nuance to each brush mark. The remaining five options have no adjustable settings and would typically be used with paint-type brushes. Noise adds pixel turbulence to your brush tip; Wet Edges imitates the look of water colors, making the center of the brush partially transparent; Airbrush turns on airbrush-type color blending; Smoothing helps soften brush strokes; and Preserve Texture ensures a consistent canvas texture (the last control is called Protect Texture in CS5). Half to fun of creating a new brush is sharing it with others. Choose Edit->Preset Manager. Shift-click your new brush (or brushes) and then click Save Set. Give the set an appropriate name and save it to your desktop. You can now email this file to friends and colleagues. Once in hand, they can double-click it to automatically add your unique brushes to their current brush set. Easier merging of HDR images. Lens Correction filter uses camera/lens profiles. Better noise reduction in Camera Raw. Many plug-ins/filters work only in 32-bit mode. App generally does not feel much faster.